You are currently browsing the tag archive for the ‘snow festival’ tag. With the rare blizzard conditions that hit Kanto this past weekend, ” the day after” provided the best conditions for kamakura building. All the children in our neighbourhood it seemed, came out of the woodwork and were seen at snowplay, a bunch of kids were playing baseball with snowballs, while my son and his friend set about building their first kamakura. 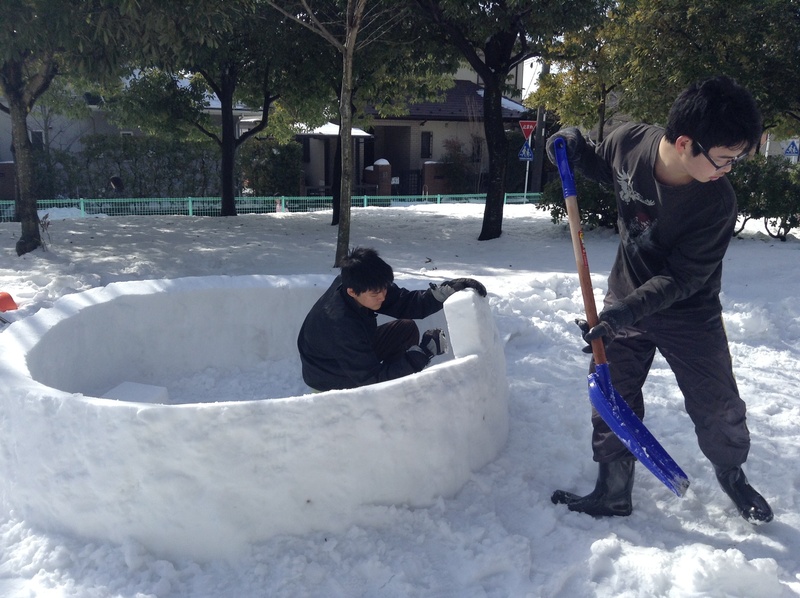 Below is a photo of the boys at work building their “igloo” kamakura. When they had finished their snow hut around noon, kids soon streamed by to take photos with the hut, and to play inside. A neighbour came by and kindly offered the little lamp to light up the kamakura. By the way, people often head out on Feb. 15-Feb. 16 with their kids to see the see the snow huts called Yokote Kamakura in Yokote, Akita Prefecture for the experience of playing in snow huts. 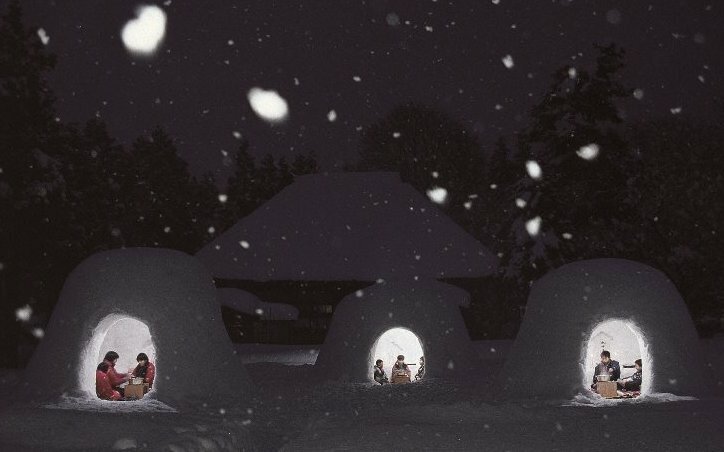 The event is called the Yokote Snow Festival and 100 snow huts are built for visitors to experience. Yokote Kamakura, Snow Huts in Yokote, Akita Prefecture; Playing in snow huts is a popular pastime in winter for children living in areas with heavy snowfall. They make snow huts called kamakura in which they play games and eat traditional delicacies. 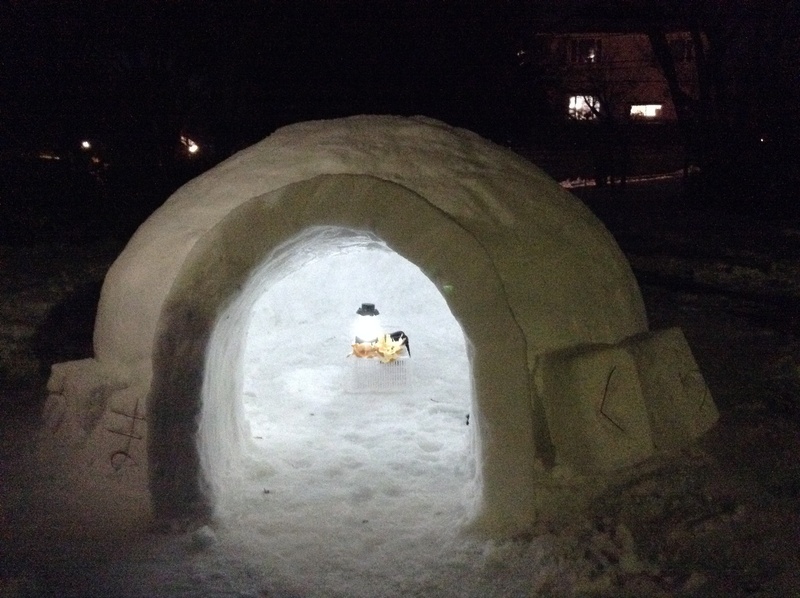 About 100 snow huts, and a number of snow creations are built on Kamakura-dori Street, in front of the Yokote City Hall branch office and at Yokote Park and so on. The best time to see this event is from 6 p.m. to 9 p.m. (either day). Access: (1) The JR Ou Honsen Line to Yokote Station, and then walk 10 minutes. “The festival is held annually on February 15 and 16. Kamakura is the name given to small igloo-like structure made entirely from compacted snow. Yokote city lies in an area of heavy snowfall where 20 to 30 centimeters of snow may fall overnight. Kamakura festival uses this snow in a festival that can only be found in such a snowy place. The Kamakura festival is held during the lunar new year together with other seasonal events such as the festival where pine and rope decorations used at the previous new year celebrations are burned in a sacred bonfire, a ceremony to pay homage to the god of water, and the ‘torioi’ ceremony to pray for an abundant harvest. In the past there have been water shortages in this region and that is why prayers are offered to the god of water, and the water god is enshrined inside the Kamakura. The Kamakura festival was also a way of spending a few simple days in a small hut away from the usual material temptations of life. These days, however, the rites chiefly involve children.